Mr. Javamet is cleaner, but not clean enough. I hate car wash facilities in some regards because I never get as good of a wash as with a wash in our own driveway, but it’s better than not washing the car, but this is an excuse to snap a few quick pics. Washing has the drawback of reminding me of things such as the people who ding the car in parking lots or worse, a collision with a deer this car suffered. I even had a tiny bit of fun with the car for a change and took a slightly more spirited run up a curvy hill with it where I knew I could do so safely and not put myself, the Saab or anyone else in danger. Woo hoo, the old man (me) went over the speed limit! Kind of strange still for me, this 2011 and the other 2009 9-3X (or more accurately AWD) with their ESP stability stuff don’t give the same kind of feel going through curves as the older models. It is ok, but just a different feel to the driving and a very stable feeling. After another 3 hours at our local registry bureau aka DMV, 7 hours total time including a useless emissions test, our 2009 Blue 9-3X is street legal! 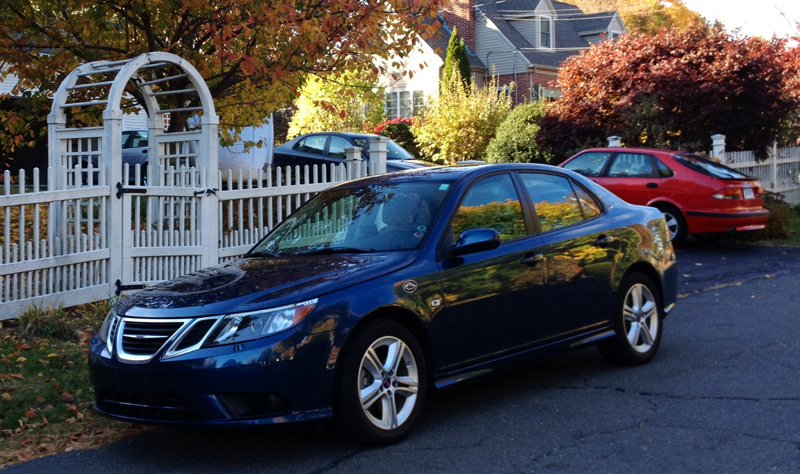 The blue car is now without the badges our friend and previous owner sported, and was delivered to us incredibly clean and loved. 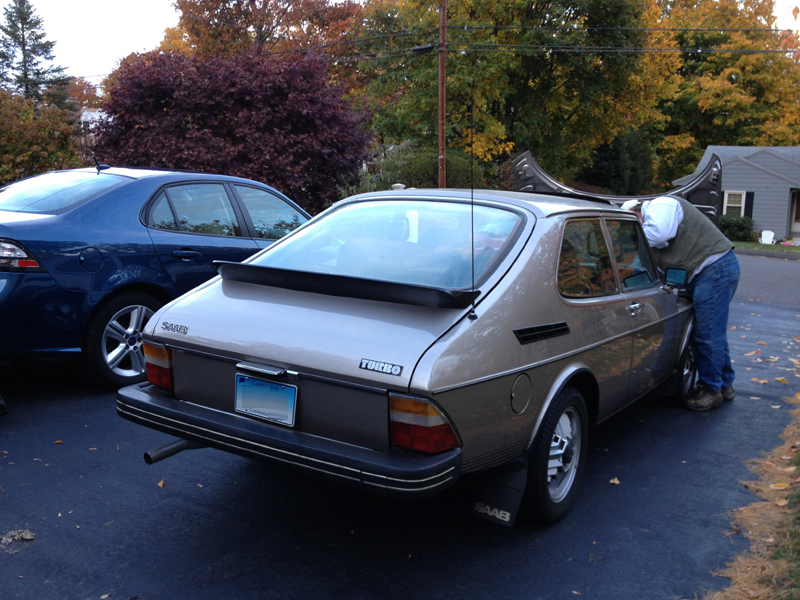 It was another boring day of moving Saabs around, removing and attaching license plates, etc. and I am still anxious to get more up to date and clean Viggen pictures as well pictures of this pretty blue 9-3. Sometimes I hate driving our Saabs. When and why? Who cares? No one. But I do. Having driven the 2002 on the highway today versus my more typical local, but also locally driven today, I remembered how much fun even that “plain Jane” 9-3 SE is. It is still dirty and now full of extra tires and wheels and things to be given to a new owner, and yet it was still a blast. So the next car to be sold or whatever, made me want to keep it, partly because it is fun to drive a manual / stick, and I’ve been doing more 9-3X automatic transmission driving, for routine use. Sure, I’ve been driving or was driving the 99 Turbo and Viggen too with sticks, but after 9-3X automatic driving, the red car was still fun, also because of how it handles. And why is everyone so crabby and mean, or most people visiting the DMV? I get it, no one likes waiting around for 3 plus hours in a room full of icky smells, and people sneezing and coughing on you, and people yelling, but deal with it, we all must do this or hire a concierge to register cars for us. Driving the Saabs was a highlight of the day and driving several of them at that. Trying to activate OnStar in the 2009? Not so much fun. Our non regular dealer recently replaced the module at no small expense to previous owner, and onstar is confused as to what kind of car it is now, in spite of me giving them the VIN id. 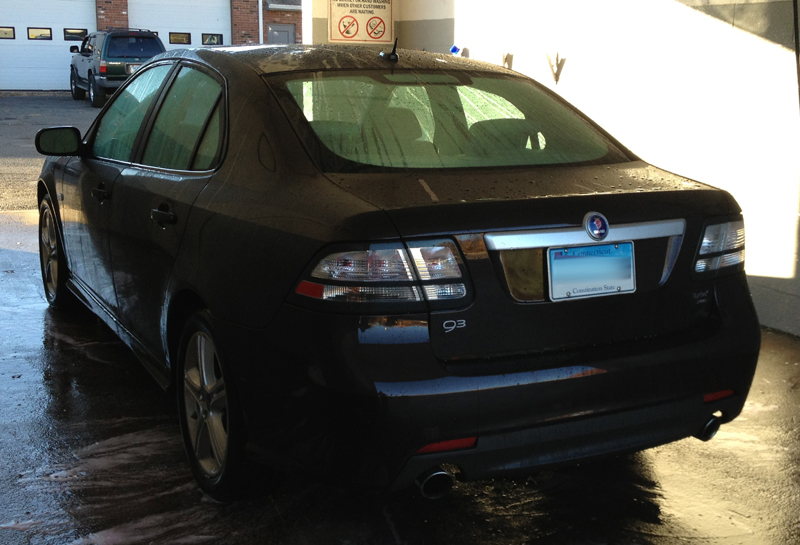 Sad is, OnStar reps not knowing what Saab is or how to spell Saab, and asking me if it was something made by GM, and accidentally, repeatedly attempting to DE-activate OnStar in the 2011 Saab we also own. It’s a neat service if the car gets stolen or in an accident, but having used the full featured OnStar in other cars during the free trial, we were never impressed. And they’ve now outsourced initial contact and support to somewhere outside our “homeland” and the service, I am sorry to say is not as good. Don’t know if I will get the OnStar activated in Blue 2009 or not, they can’t do much with it as they do for other GM models, but tracking a stolen car or calling for help if there’s an accident seemed worth burning the money on to us. If nothing else, the blutooth handsfree calling thing is nice. 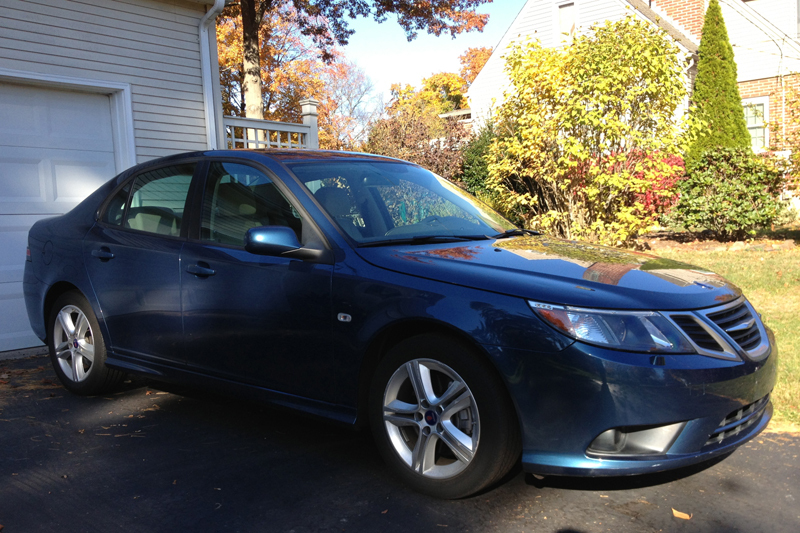 Mrs. Saabnutrs claimed the blue Saab today, we will see if she likes and keeps it or goes back to the 2011 in Javamet. I won’t care which she chooses, as I will end up with the other and that’s more than ok with me. 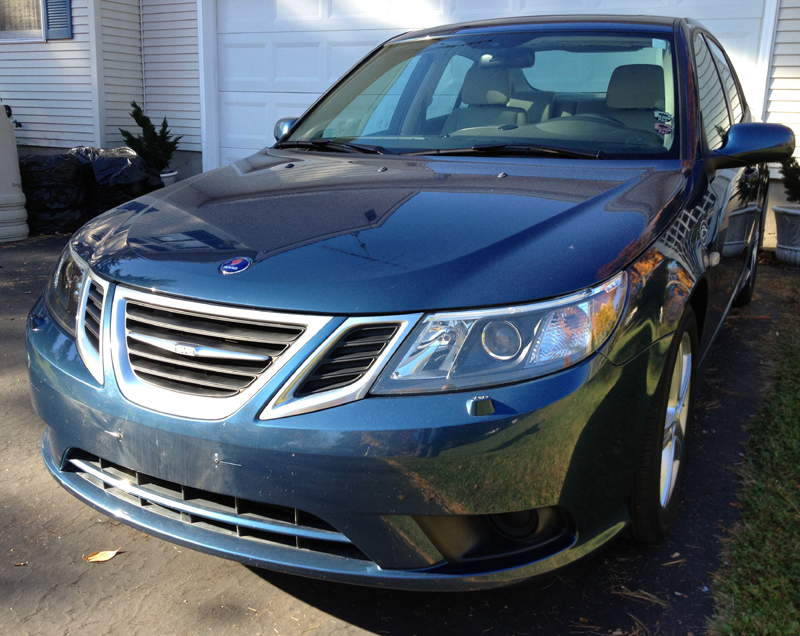 Some pics from morning before Blue set sail for daily use, and I want to wash it again and it WAS clean Saturday. 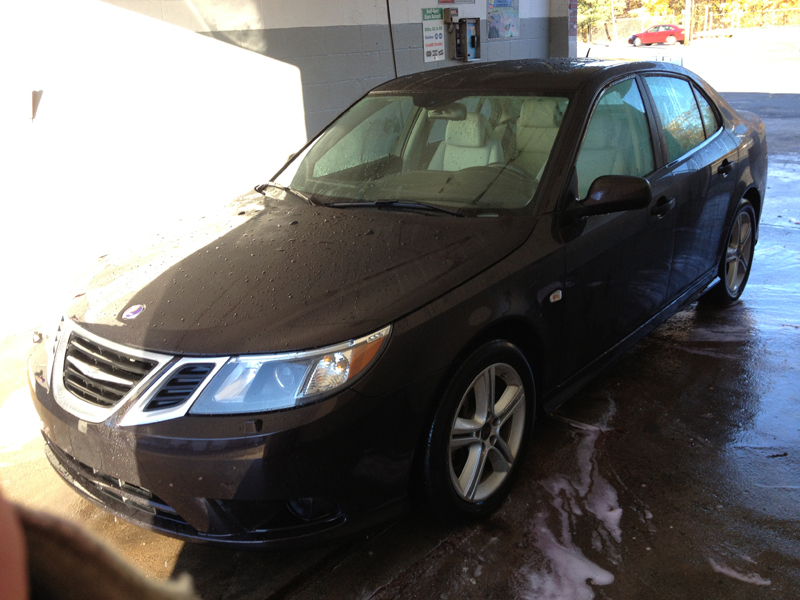 Meanwhile I will wash Javamet 2011 again and possibly the Viggen. 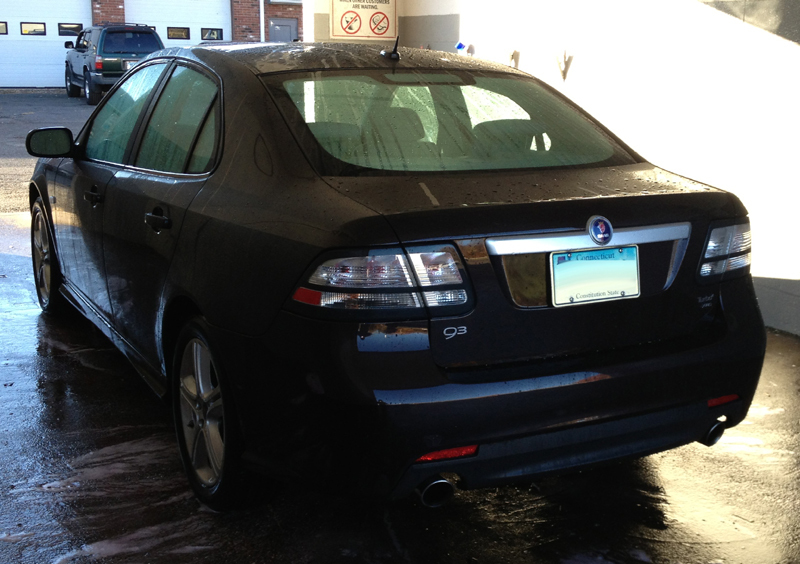 Can never be too clean, right?… as long as I don’t take the paint off! There will be no awards for my photography or choice of setting for the photos. It’s a hideously ugly car wash in a run down industrial neighborhood where I took out the camera phone and with bad lighting and perish the thought, I used the camera’s flash! 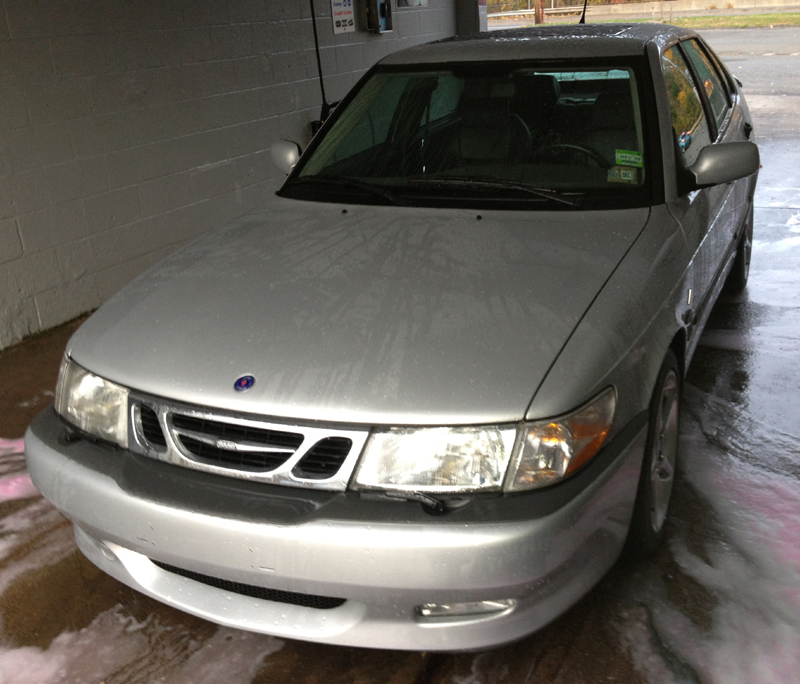 But at 15 years old, I still can’t believe how pretty I think our 2000 Viggen is no matter what the setting. Just a quick wash today with a more proper one planned this week to fully remove the bird droppings and bugs that find the car even on the shortest of drives. And why is it, that after cleaning a car, and driving home, 5 miles? The birds still find me at dusk so that the car returns home with %$#* on it? 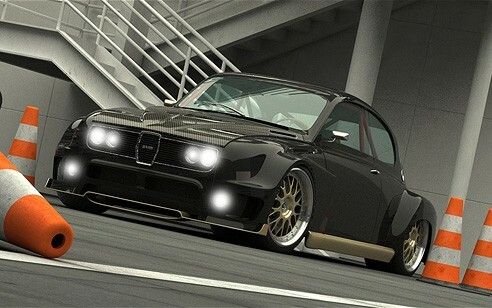 I’ll also admit that I am a sucker if you will, for all nearly things Saab produced, even the Saabs some hate, but I do have my favorites from the oldest prototypes to the 95, 96, Sonett, the 99 EMS and Turbo, 900 SPG, 9000 Aero & CSE, Viggen, and on the list goes. Having just sold our 99, the Viggen’s garage mate, I hate to admit the Viggen, pretty as she is, does not have the curves front and rear of a 99. That doesn’t mean I don’t admire the Viggen’s aesthetics, and although I feel sad going through our garage and not seeing the 99, seeing the 2011 9-3X in the garage is a treat. But what really gets me going? Driving the cars of course, and I think that’s what it is all about for me, for us, going to the trouble of owning cars that are now not as practical as other choices. 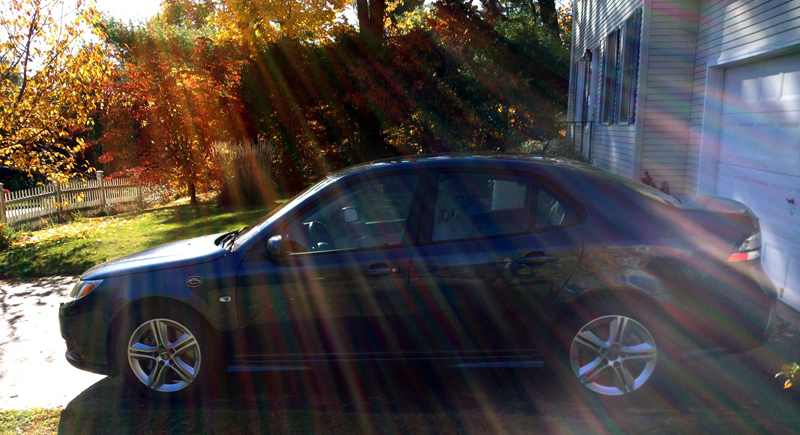 I am blessed to share my life with a woman who somehow got the Saab bug too and hates driving ANYTHING else. And THRILLED to have driven the Viggen again, and that EVERY TIME I drive it, I remember why I don’t ever want to sell it. It doesn’t have blutooth, which I hate to admit is incredibly convenient and helpful in the 2009 and 2011 9-3X’s we own, BUT I’ll also admit, the last thing I want to do is be on phone returning calls when I am in the Viggen. 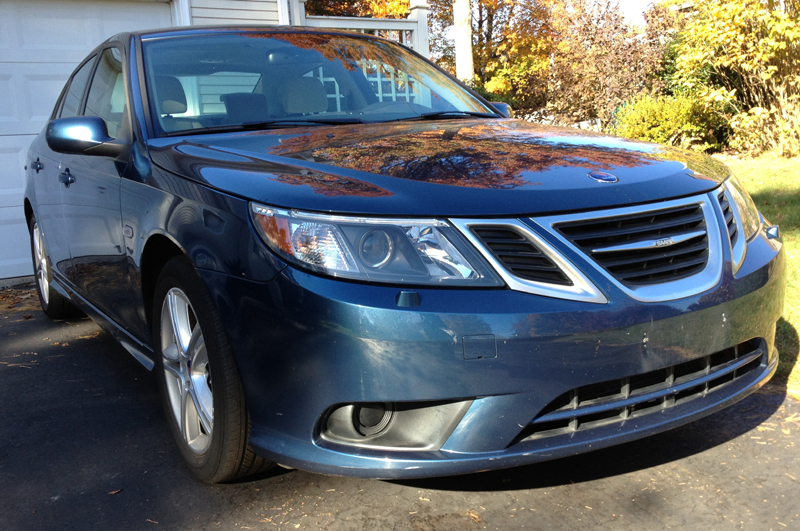 The car ends up being a needed and welcome sanctuary for this self-employed, work-a-holic. As much as I LOVED our 99 Turbo and it’s more “pure human meets machine” kind of feel to drive, as well our now gone 1993 900 Turbo and ’94 900 Turbo which were both a blast, the Viggen for me, is an ultimate combination of being an incredibly able grandchild of the 99 Turbo but with incredible refinement and comfort. 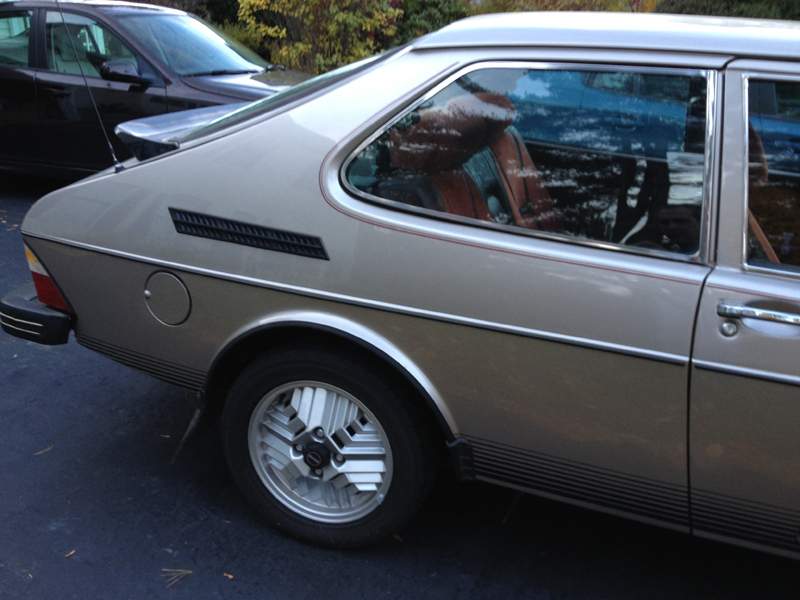 Yes, even in middle age, I like the premium sound system, and everything else about the car. I know others complain about torque steer and other issues, but I’ve never had a complaint about our Viggen, no offense to more discerning Saabers. One more pic of our baby below, and the suggestion that if you haven’t driven one, I still recommend the Viggen and am SO glad we bought it new and have been able to KEEP it new. 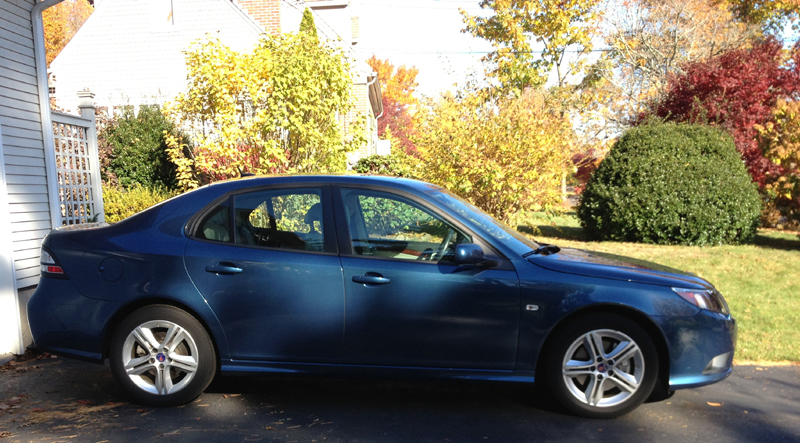 We are happy to welcome the newest member of the Saab fleet home, a 2009 9-3 AWD in blue. But it was a busy and hectic day, at one point having 5 Saabs here, preparing to show 1 of our Saabs, the 1978 99 Turbo to a buyer. Our driveway can and has held 6 cars easily, the garage has 2 spaces, BUT if you want to drive anything other than the cars at the bottom of the driveway, it does require effort. 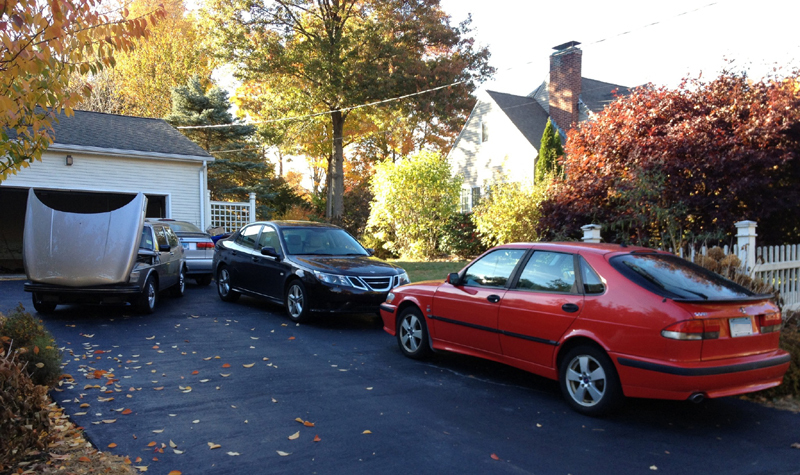 So for part of Saturday, there were 5 Saabs here, all ours. A closer view of driveway while the blue 2008 was in the street and 99 hood was up and before or after Viggen got out of garage for its afternoon jog. I love the hood and nose on the 99, but hood or bonnet being open, I got a picture of that curvy back end I adore so much. 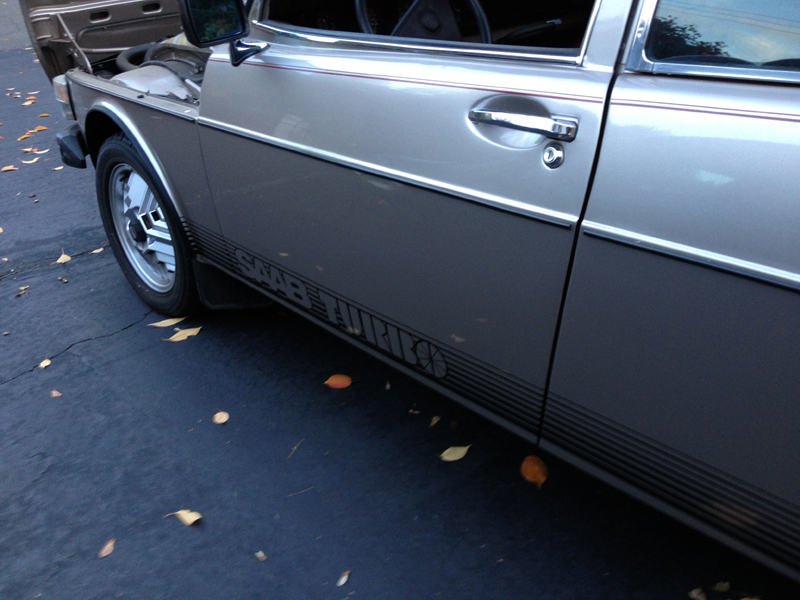 … and the side proudly touting the turbo power of the car, I wasn’t actually a fan of graphics but the person who restored did a superb job reproducing the original graphics. and finally another shot of one of my childhood dream cars which I am thankful to have owned two of in my life. The 99 has a new home, and the 2011 9-3X scored a coveted garage spot, but we will both forever miss seeing and driving the 99 Turbo. 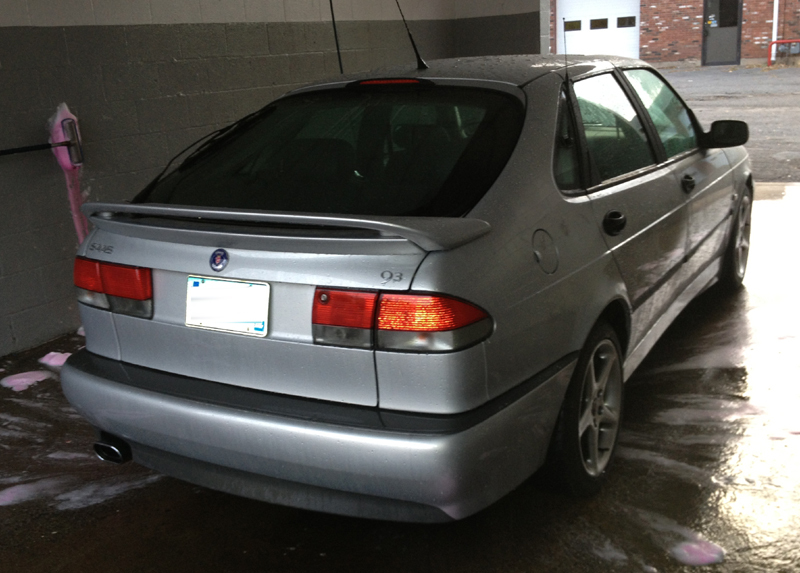 The 99 made me smile every single time I drove but also just seeing it in the garage, as does our Viggen, oh heck all of them, but the 99 was truly special in part as a car of my youth that I was able to own again as an older adult. Finally; on the way to its home with new owner at the wheel, the old 99 Turbo faced a challenge. New owner was cut off by an SUV driver on a dark state highway known for deer collisions. The SUV immediately locked up its brakes in front of the 99. The 99 and her great new owner were able to avoid hitting the SUV which hit a deer, sending SUV and deer parts everywhere. 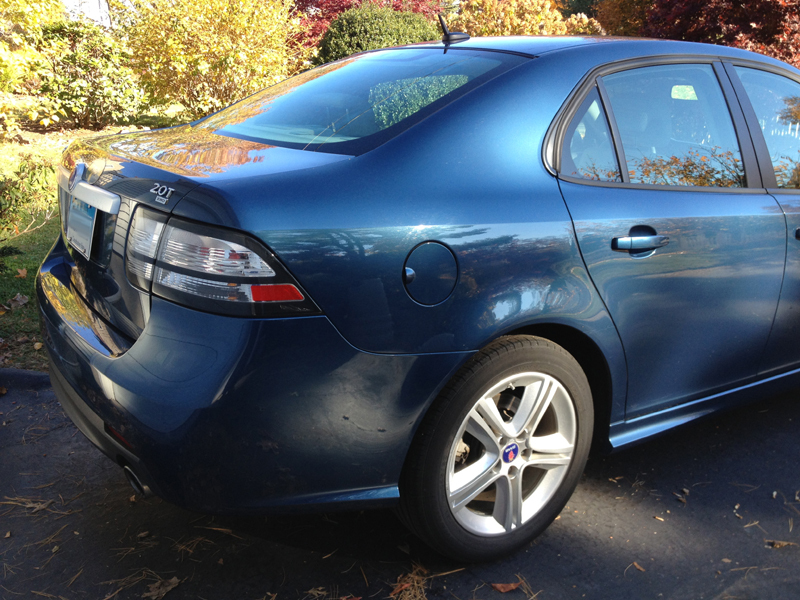 A testament to Saabs for us is how well these cars can take a hit from deer or moose, but also how well they can help a driver avoid hitting things in the first place, and being able to respond with quick steering and braking even at 60 miles per hour plus. 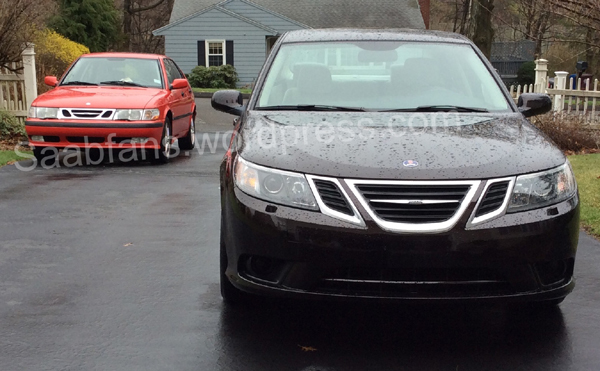 Kudos to the new owner and Saab. May you both live long together, shiny side up. 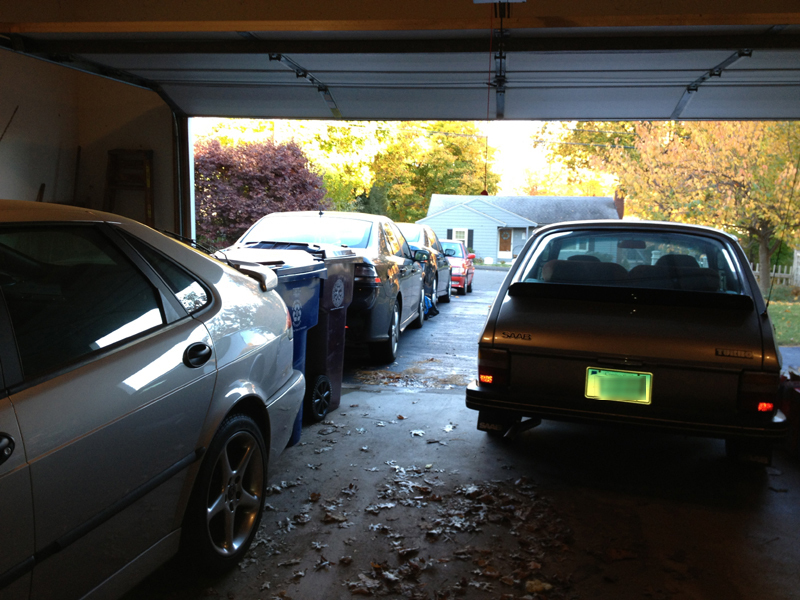 But what is sad and made me laugh was just listing the Saabs we own / owned and realizing #9 is coming to us tomorrow. What was sad is my having lost count and thinking it was only 8. I’m old(er) and tired but it’s not like me to do that and lose count. I realize I am not the record holder, but it did surprise me, and we miss the ones that aren’t here with the exception of one we should not have purchased used. Poor “Woody” as we named it, never had the love he should have, nor did he give it the way our other Saabs did. 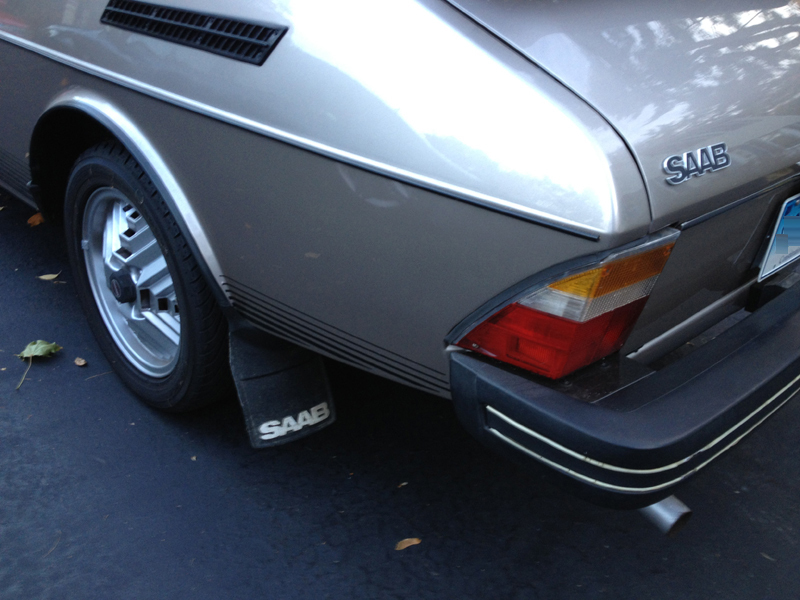 Those of you who follow Saab cars likely do not need me to mention Saabnet to you. Surely, Scott who started The Saab Network aka Saabnet 27 or so years ago, does not need MY help promoting the site, but I am doing it anyway! 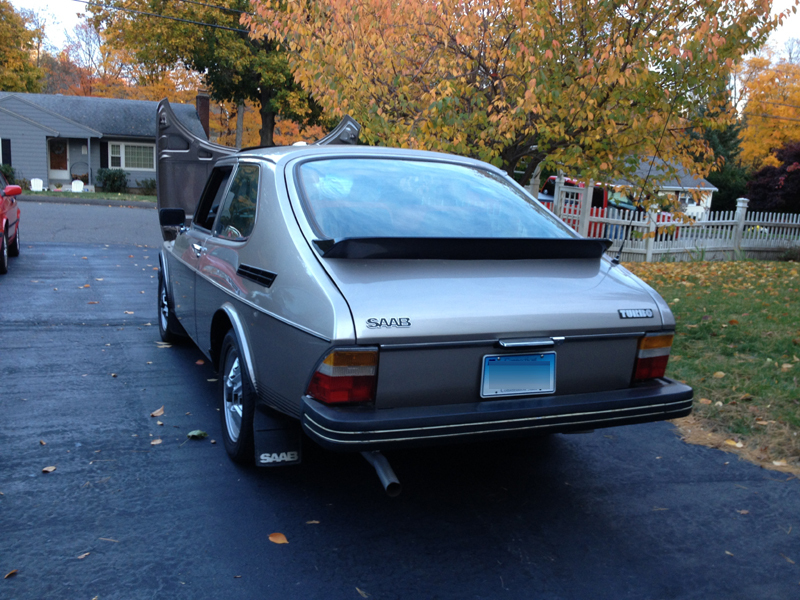 A quick thank you and kudos to Scott for running the longest standing and my favorite of Saab site, from the bulletin boards to the classifieds, Saabnet is second to none. I’ve also recently listed two of our current Saabs for sale on Saabnet Classifieds. I have to say, it is worth every penny to advertise on Saabnet. As to classified ads on Saabnet, from the moment we listed our cars on Saabnet, inquiries started pouring in from both near and far around the globe. No joke, no exaggeration. 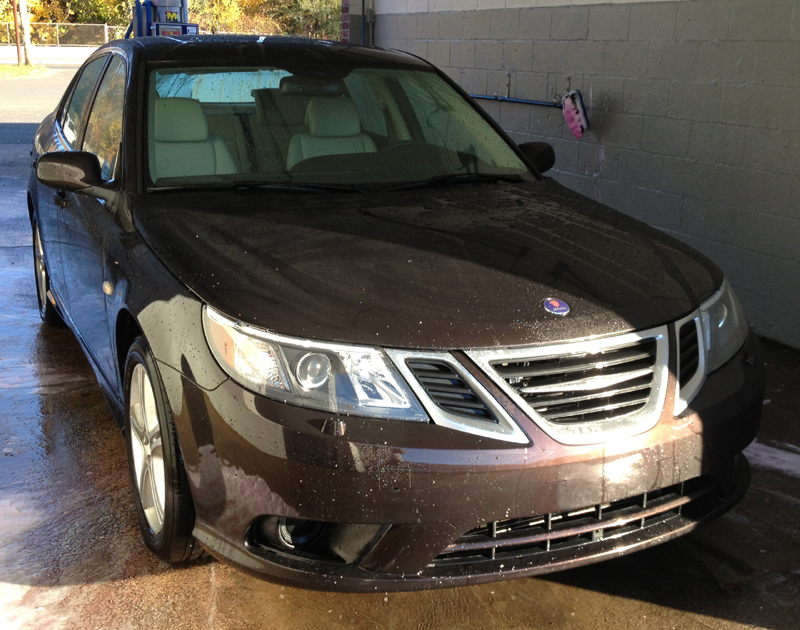 Saabnet is an unparalleled resource for Saab owners and buyers. There are friendly and knowledgeable people on Saabnet who help one another out tirelessly and other fun site features and great resources for parts and people who know and service the Saabs. Thank you Scott and Saabnet members as well. It has also been great to hear from fellow admirers of these cars and to see how intelligent most interested buyers are including knowing what questions to ask. 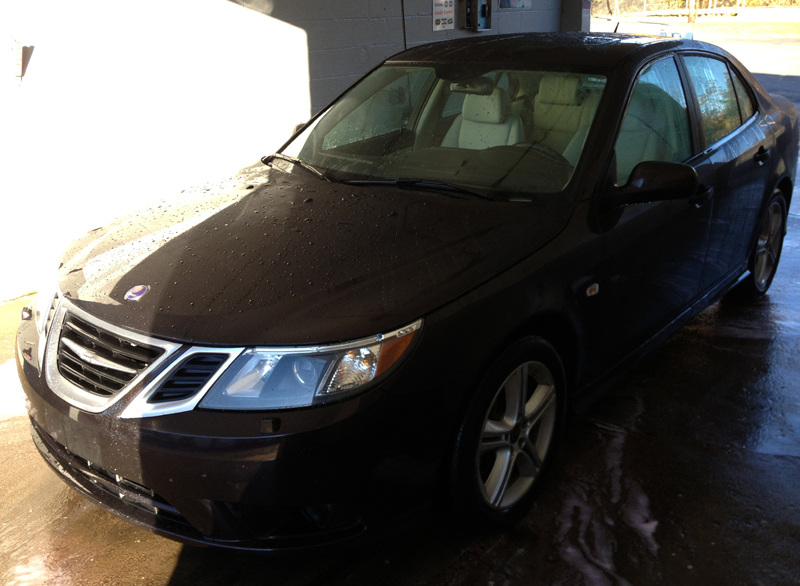 I tell everyone I know, as often as I can, if you have a Saab to sell or are looking for a Saab, Saabnet is THE place to go. Thank you once more to Scott and a salute to you for what you have done and built so consistently and for so long. Well done sir, and thank you for staying committed to all of us and our cars. 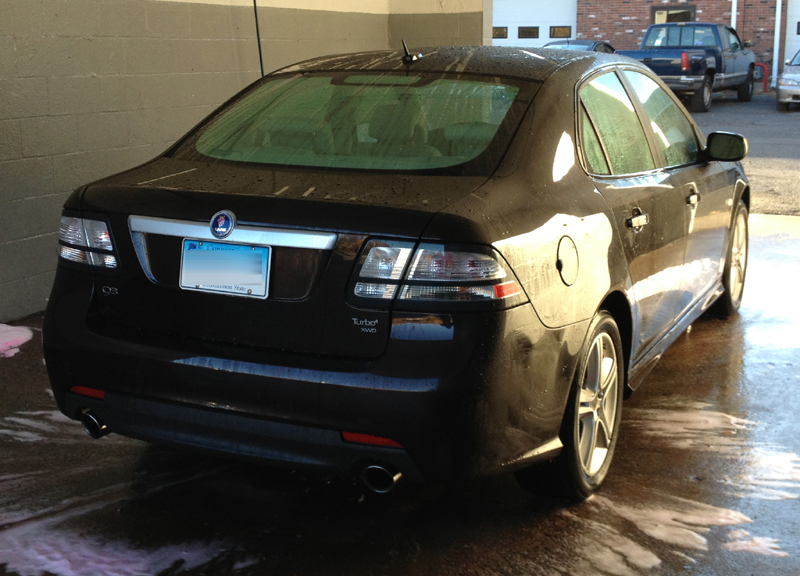 It would be much more difficult to own and maintain these cars if not for people like Scott and the Saabnet members.